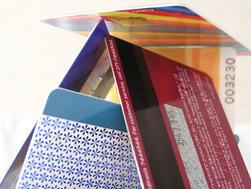 From plastic card design to card production and personalisation, Xantium is a partner you can rely on. Quality guaranteed using innovative products and services to keep our clients at the forefront of their respective industries. Xantium Integrated Solutions was founded in 2004 and is regionally renowned as a leading supplier of all types of plastic cards from Scratch, Prepaid, and GSM cards, to Commercial, Access, Identity, Contactless and Banking chip Cards. Through our international partners, Xantium has access to the latest technologies and innovations, ensuring premium quality, excellent customer service, competitive pricing and fast delivery. Xantium boasts a fully accredited Visa and MasterCard bureau - focusing exclusively on card personalisation and fulfilment. The bureau is able to track every card via a state-of-the-art, proprietary developed, Track and Trace system.